Teeth whitening can lighten and brighten stained or discoloured teeth. It is a safe procedure when carried out by a qualified dental professional, but it may not be appropriate for everyone. Ask your dentist at Crookes and Jenkins about teeth whitening today to improve the appearance of your smile. In-office whitening begins with a short preparation to cover your lips and gums, leaving only your teeth exposed. The whitening gel is then painted on your teeth and a light is applied to help activate the gel. The light and gel work together to gently penetrate your teeth, breaking up stains and discolouration. During this time, you can relax, watch a movie or listen to music. The gel is applied for three 15 minute sessions, for a total of 45 minutes. You leave with a whiter smile and a home whitening kit, which allows you to ‘top-up’ the brightness of your smile should you need to in the future. Your dentist will take an impression of your teeth so that a custom-made mouth tray can be made. The trays hold the whitening gel close to your teeth and ensure the gel is evenly spread across every tooth. The trays are light enough to permit talking and working with them in place. The gel comes in both a day and night time formula, and when worn for a specified period of time, will gradually lighten your teeth. You will usually see great results in two weeks. You can control how white your teeth become by stopping the whitening when you have achieved the results you are happy with. Why should I whiten my teeth at a dentist? Whitening your teeth at a dentist is beneficial for a number of reasons. Most predominately, dentists will recommend a treatment that will whiten your teeth without damaging them. Whether you choose at-home or in-office whitening, the treatment won’t harm your teeth like some over the counter whitening kits can. Some of these non-dental recommended tooth whitening products use chemicals that will dehydrate your teeth and cause harm. This is why going to a dentist is a better idea. Why are my teeth yellow and stained? Do you offer in-office whitening treatments? Yes! We offer an in-office whitening treatment. First, your lips and gums are covered to retract and protect them. Once your teeth are cleaned, we will paint a whitening gel onto them before light is applied to activate the gel. The light and gel work together to gently penetrate the teeth, breaking up stains and repairing any discolouration. The gel is applied for three to four sessions of 15 minutes each, for a total treatment period of up to an hour. You can expect whiter, brighter teeth immediately following the treatment process. It depends on which treatment you opt for. If you decide to undergo an in-office whitening treatment, the procedure will take around an hour to complete and you will notice the results immediately following your appointment. If you decide to go for an at-home whitening treatment, you should start to notice the results within around two weeks. You can, control how white your teeth become by stopping the whitening as soon as you have achieved the results you want. I want to whiten my teeth at home. How can I make sure that I do it properly? If you prefer to whiten you teeth, it’s no problem. We offer at-home whitening kits that are easy to use. You’ll need to come in for a consultation, during which time your dentist will assess your teeth to ensure it is safe and appropriate to whiten them before making impressions of your teeth so that custom-made mouth trays can be made. The trays hold the whitening gel very close to your teeth and make sure that the gel is spread evenly across every tooth. You will be given either a day or night formula, both of which work to gradually lighten the teeth over time. Ultimately, whether you use in-office or at-home whitening treatment is up to you. Obviously, price, length of treatment and how white you wish to make your teeth are predominant factors. However, when you go in for your appointment, your dentist will assess your teeth and can give you an idea of which treatment would be best suited for your individual needs. 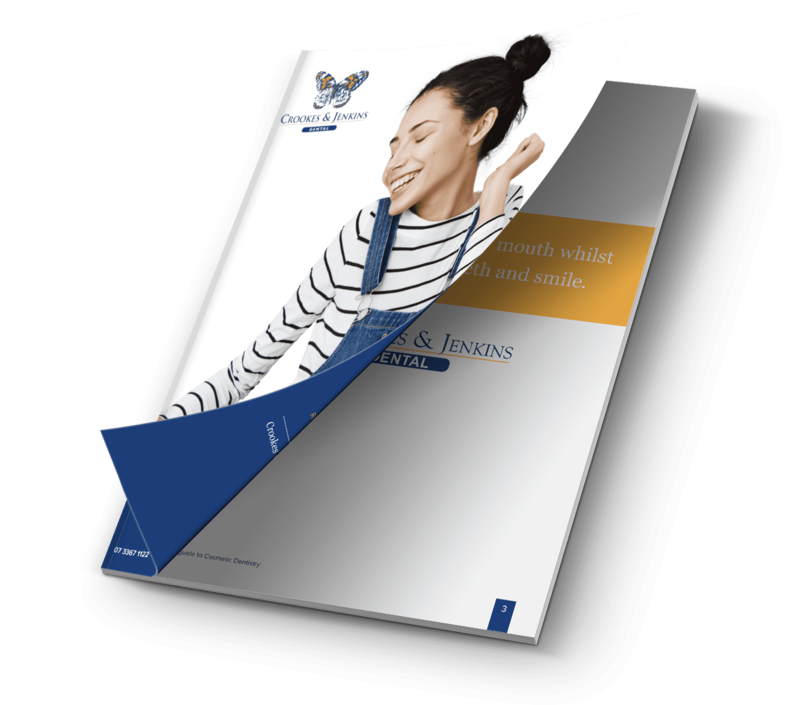 If you want more information about teeth whitening or want to book in for a consultation, contact us at Crookes and Jenkins today.